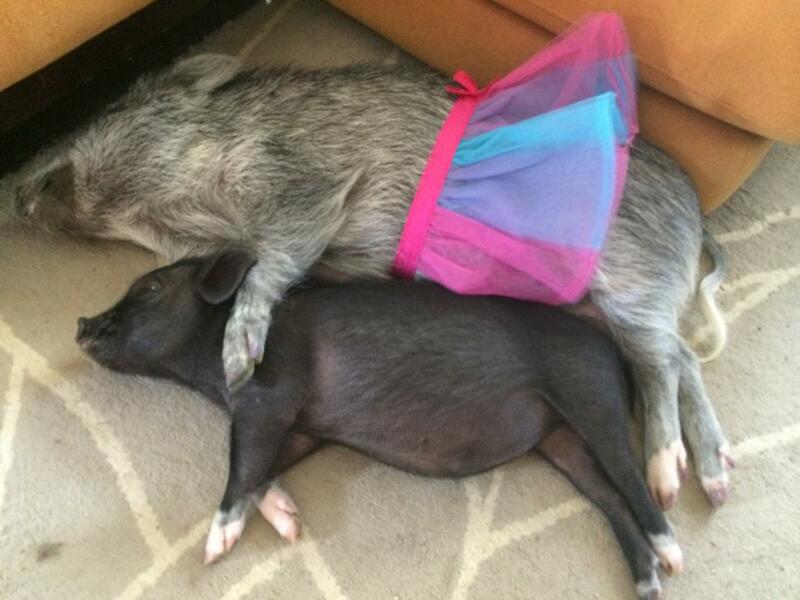 Potbelly pigs make amazing house pets and companion animals. They are very intelligent, so training pigs to do tricks, adjust behavior, or use a litter box indoors is a relatively easy task. Since they are food motivated, using positive reinforcement with veggies as treats is a great way to train a pig. Pigs are incredibly compassionate and affectionate animals. They do well in pairs or multiples because they are herd animals by nature. Since pigs are intelligent, they can easily become bored and destructive when left alone. However, in a multi-pig household, you’ll find your piggies snuggling and always together. According to Vegan Peace, a pig can run a 7 minute mile. With domesticated potbelly pigs, Scientific American estimates running speed to be about 16mph! This is due to instinct, as pigs are prey animals and relatively low to the ground. They must be able to outrun potential predators. Potbelly pigs aren’t considered full grown until they are 2-3 years of age. While most of their growing is done by the time they are 1 year old, they still add weight up to 3 years of age. A domesticated potbelly averages 65lbs to 200lbs in adult weight. (Source: The North American Potbellied Pig Association). Teacup pigs are a complete myth. Breeders use terms “teacup,” “micro-mini,” “nano,” and “miniature” to sell more piglets. All potbelly pigs are born around 9oz, and can fit into a teacup; by the time they are full grown, reaching a maximum of 200lbs healthy weight, they ARE miniature compared to a full-size farm hog at 800-1200lbs! Pigs are very good at recognizing danger or trouble. There are many documented cases of owners being saved from fires or dangerous situations by their pet pigs. In June 2014, a potbelly pig saved its family from a fire in Illinois; read the full story here.